Katie joined Whole Pet in August of 2015 as a Client Services Representative, following a couple of years of shadowing the doctors. 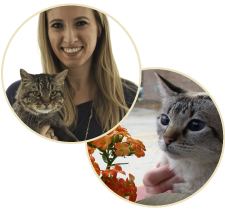 Prior to joining Whole Pet, Katie attended the University of WI-Madison, graduating in 2012 with degrees in Psychology and History. Although only part-time, Katie thoroughly enjoys interacting with the amazing clients and patients at Whole Pet. When she is not working, Katie enjoys spending time with her fiancé, Eric, their two fur kitties, Phoebe and Finn, seeing any movie, and traveling the world.